When choosing a website hosting service, there are numerous factors that you should take into account. For example, most web hosting services focus on speed, uptime, and the security of the service itself. After you have bypassed these factors, the next consideration that you should take into account is how your website is going to look once it is up on the webhosting service. If your website does not look good, then you can be certain that you will not meet the expected traffic threshold. For those who are looking at a professional and simple option, then check out the image of the website below. 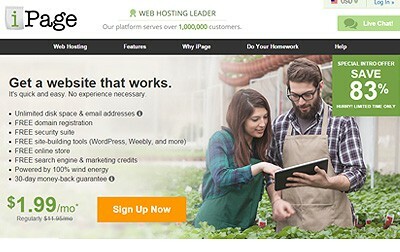 Ultimately, iPage offers users the opportunity to develop websites that are clean, functional, and professional. If you do not like this particular template option, then there are also other professional options offered. Once you figure out what you like best, you can tailor it to the specific type of website that you are developing. For example, similar to the below example, you can feature your particular service and provide a call to action to compel users to read more. The next type of website that you can develop when using iPage is one where there is an aesthetically stunning image or set of images. Templates that focus on images are particularly great for those who are looking for a website to host their portfolio. If you do not have a portfolio, then you may want to consider these types of templates as also ideal to sell a product. The clarity of the images and the functionality are what make iPage a great option for these purposes. Finally, if you have a service that you are offering, then iPage has many templates to suit your needs. The particular template below not only makes the service clear, but it enables the website owner to place critical information where users mainly look. In addition, once the user views the most critical information, then can simply glance below and view the tabs available. As you can tell, this option is highly convenient, functional, and aesthetically pleasing. When creating your webpage with iPage, it is also useful to remember that iPage offers you a lot of customization. Therefore, you can create a website that reflects well on what you are offering. Not only are the above sites exemplary of what iPage has to offer, but they also provide you with insight as to what you can do with your own site once you get your iPage subscription up and running.